The full title of this coffee table book by the photographer and arborist Julianne Skai Arbor is TreeGirl: Intimate Encounters with Wild Nature. It's something of a three-in-one book, presenting luscious photography, detailed botanical information and even some spiritual teaching, too. Which is why she had to self-publish it, she has said. But she produced a gorgeous book with all the trimmings, something a publisher might not have done. This three-in-one approach, you can imagine, makes a reviewer's work three times as hard. But in an odd twist of fate, Arbor (could that really be her given name?) has paired each photo of a tree with a naked woman, most of which are her. One reviewer felt that this provided scale (it's common advice to include humans in your landscapes for just that reason). Well, it does provide scale. Even human interest. And it's tastefully done. Throwing in a male here or there would not have helped, we think. Women, it's generally conceded, are more in tune with the connections between things. Which is to say, the roots of each tree embracing underground rather than missing the forest for the trees. But as this is a botanical publication interested in the permutations of various varieties of plant life, we'll leave the artistic interpretation to other experts and the appreciation of her life advice to wiser souls. TreeGirl with Boab. Prison Tree Respite (2015). Or have we got that wrong? It's easy to get distracted, going through this very lush book. You can read it so many ways. But that's not why we had trouble reading it. We had trouble reading it because we had the ebook edition. And, no, you should never try to read a coffee book in an ebook version. There is endless scrolling and the feeling of never being quite in the right place. Trees are my secret love. I can gaze endlessly at their beautiful complexity, marvel at their simplicity of being and envy their tenacious rootedness in one place. Every day, I long to be with trees, to sit under them, climb high up in them, collect their abundant gifts, learn about them and listen to their ethereal songs in collaboration with the wind. Instead, I spend too many days sitting in front of a screen, zooming behind a wheel, accumulating manufactured objects and interacting with other two-leggeds and their noisy, handheld gadgets. But when I can, I steal away from the scheduled, maintained world to be alone with the trees, whose strong arms exalt the blue sky, whose gnarled roots kiss the rich earth and whose generous, cascading foliage grants me peaceful shelter and companionship. When I am not able to be alone with trees, I dream of how one day I can disappear into the woods and simply become one of them. An extended quote to demonstrate her intelligibility. And her appreciation of the modern problem of being held arm's length from nature. California Bay Laurel. Typical Spread. The tree photos of some 50 species are arranged alphabetically by their common name, she points out. But the Latin or scientific name is also referenced. The natural history of each tree is listed with the photo, as well as almost baseball card stats. Chapter 3. Touch Trees essay. Lovers speaks about Arbor's own sensual and transmutational encounter with a tree. Tree Affinity explains the biology and psychology of why we are attracted to trees. Touch Trees examines a holistic view of ecological restoration and arboriculture or the science of taking care of trees. The Goddess and the Green Man tells the story of her own encounters with trees as these female and male Nature spiritual archetypes. Rewilding offers some accessible ways in which you can connect with Nature to rewild yourself. There's a world map showing you where you can find various species that doubles as a table of contents (although there's one of those too). And a graph showing the relative height of each species. Graph. The tallest, the smallest, the thickest, the thinnest. That description should confuse you sufficiently. This isn't the kind of coffee table book that you're familiar with. Not something about cats or sports cars or that championship season or flowers. Trees are accessible wild beings, Arbor has said. They make it easy to make a connection to nature. If you ask permission, she adds. There you go, it's not just a photography book, not just a botany book, but an adventure book too. One thing it is not is a pretentious book. Arbor is a genuine soul and her obsession with trees is infectious even if you prefer herb gardening or fast food. It's also a bit inspiring. We were briefly inspired to consider putting together a photo book of ourselves napping in various beds and couches around the globe (but the science of it eludes us). In addition to her Web site, where you can see many of the images, we can also recommend Richard Bendon's recent interview with Arbor. In the interview (around the 34:00 mark) she talks about photographing the trees. She practices "slow photography" in nature. The slow movement is about quality, not quantity, she says. She takes her time because it takes time. Sometimes she has 60 seconds to take a shot (because other people are on the trail), sometimes an hour, sometimes a couple of days. She sets up the shot, gets in the tree, gets comfortable and fires the shutter with a remote control. To slow her photography down even more, she post processes the images in Photoshop. 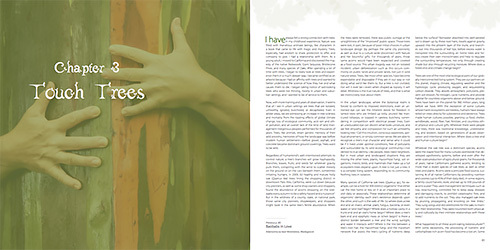 Dedicated to the memory of Diane Osborne, TreeGirl includes photographs by several other photographers in addition to Arbor, including Dean Nicolle, Kristen Rasmussen, Calyloirch Rupert Marques, Devin Stubblefield, Annett Börner, Marilyn McFarlin, Martin Fletcher, Sheryl Caston and Hal Brindley, plus a few Adobe Stock photos. Oh, by the way, no trees were hurt in the production of this book. It was printed in Germany on recycled paper. 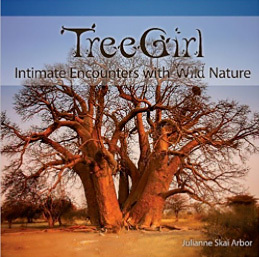 TreeGirl: Intimate Encounters with Wild Nature by Julianne Skai Arbor, published by TreeGirl Studios LLC, 200 pages, $45 (or $38.08 at amazon.com).